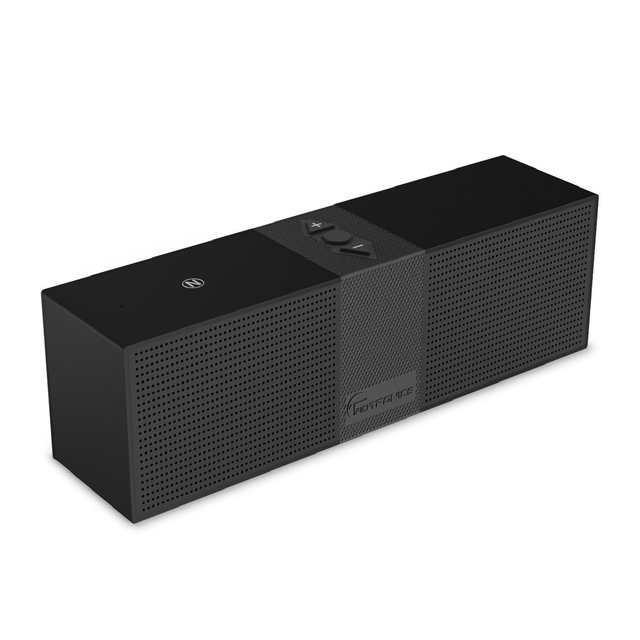 I was looking for an inexpensive bluetooth speaker for my children when I came across the TaoTronics Portable Bluetooth Speaker on Amazon. It seems to be well manufactured, has a nice rubberised exterior, and sits neatly on it’s built-in rubber feet. It comes with a 1500mAh Li-ion battery, which according to the documentation, can provide up to ten hours of audio playback. Bluetooth setup was straightforward, and I tested it with an old iPod (iOS 6), and my iPhone 5S. It also supports NFC auto-pairing which I’ll try out soon. This means you can just hover your phone over the NFC point on the speaker and it’s ready to roll. You can also connect devices that don’t support Bluetooth via a standard headphone cable (3.5mm), or via the micro USB port. I tried both of these and they worked as expected. Sound quality and volume are both very good for the price and size of the unit. Only downside, albeit a minor one, is the undocumented “lint and dust magnet” feature.